Would you believe it – it was cold, foggy and damp as we docked in Amsterdam. I could get the impression that the sun never shines here! The ship’s foghorn blared all night long. When it stopped between 2 & 3 AM, I realized the ship was already docked in Amsterdam. We weren’t scheduled to be here until 6 AM. The Master of the Constellation, Captain Tassos, did a remarkable job getting us around the Baltic, usually arriving early. After a night surrounded by fog on our cruise back into Amsterdam, it was now time for me to bid farewell to my home for the past 12 days, the Celebrity Constellation. I loved the ship, the crew, and the experiences. At breakfast, I ran into several of the friends I’d met during this sailing experience. Then, too soon, it was time to head through the main lobby, use my Sea Pass one last time, and head into the cruise terminal in Amsterdam. My bag was easy to find – and now I was off to catch a train to Paris. It was an easy walk from ship to Amsterdam Centraal Station. Even dragging my suitcase, it only took me about 20 minutes. Once in the station, I was able to find an ATM machine and the platform for my train. I was very early, as it was before 9 AM and my train did not leave until 11:19. While I was waiting, I met a couple from Waterloo, ON. They had been on a barge-biking tour of The Netherlands and were on their way to Brussels to meet family. Check out the Thalys website for information on the train to Paris. I setup an alert to let me know when I could reserve a ticket for the day I wanted – it allowed me to get a discount ticket for 35 Euros! For some reason, the ticket I printed off did not contain all the information I needed to board, mainly the coach and seat number. I was directed to the Station Master who was able to check the barcode and give me the information I needed. Getting on the train was a bit tricky as there was a big gap and three steps to get from the platform to the train.While there was plenty of room for my suitcase, it did get very tight as more people piled into the car with enormous bags! 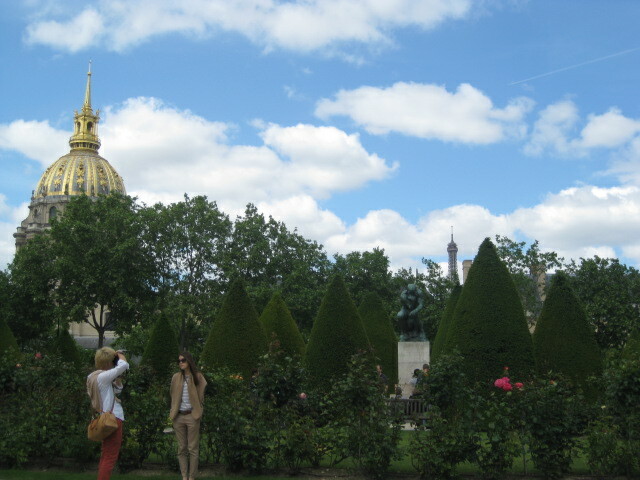 It was pretty crazy – how can you get around Paris with bags that my bag would fit in – twice. Luckily, I was able to find a place for my luggage and I was the only person in my row, so I had a comfy seat with a table and a window. The train seemed to fly across the Dutch country side. The train ride to Paris is about 3 hours and goes through Belgium. I wish I could say I saw Belgium – but really, there was not a lot to see from the train. Soon, we were entering Gare Nord, the final stop in Paris. 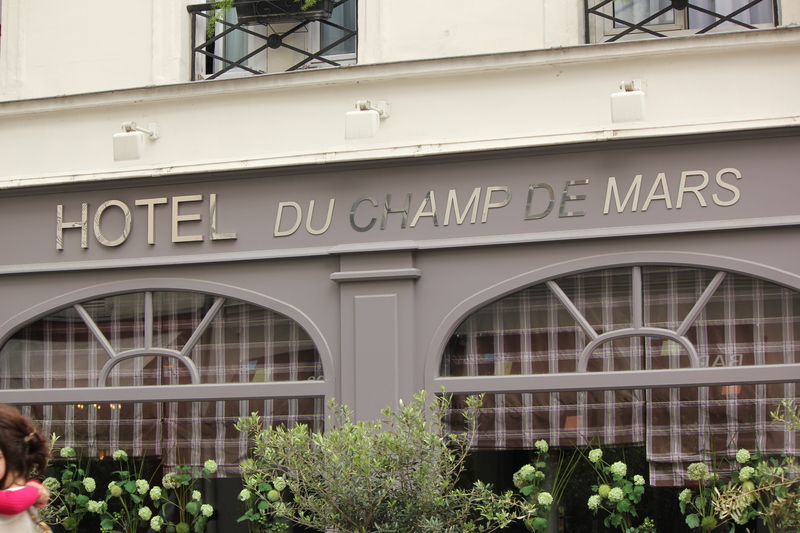 I got a shuttle from the station to my hotel in the Arrondissement 7 – Hotel du Champs de Mars. This is a beautiful hotel on a pedestrian street that is just a couple doors down from Rue Cler which is a pedestrian street filled with different shops and cafes. 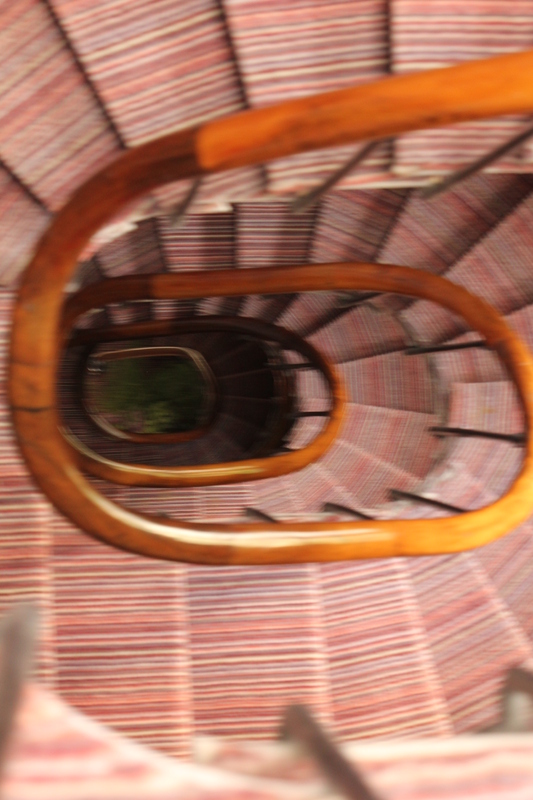 My room was on the 5th floor – and fortunately there was a small elevator, otherwise, I would have to climb the every-spiraling staircase. My room overlooked a private courtyard, so was very secluded and quiet. After dropping off my luggage, it was time for me to get to know my neighborhood, the 7th Arrondissement. 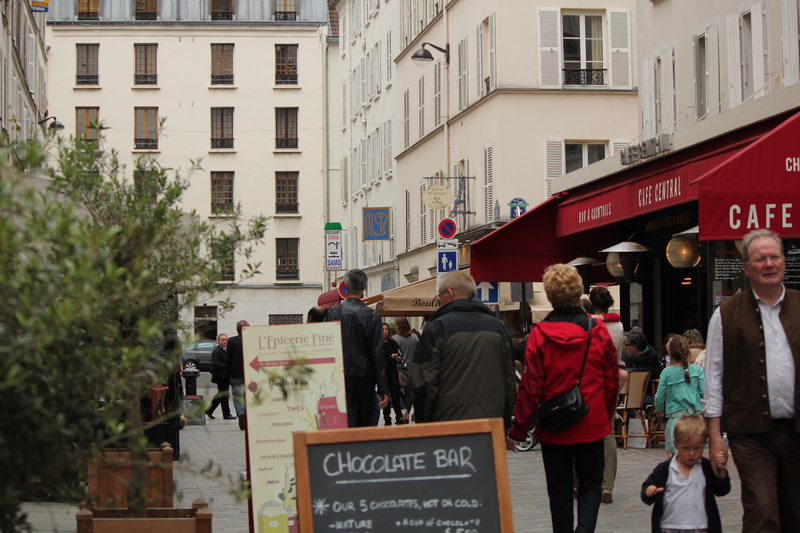 My first stop was just outside my door – Rue Cler. This is the heart of the neighborhood with cafes, and shops for all sorts of specialties. This is where people come to but their bread, fresh fruit and veggies, cheese and wine, meat and fish. You can sit at one of the cafes and watch both locals and tourists. There was even a chocolate shop directly across from my hotel! I loved it all! My hotel was centrally located with several major sites to see: Les Invalides, the Eiffel Tower, Ecole Militaire, Assemblée Nationale, and Musée d’Orsay, what a a perfect location! 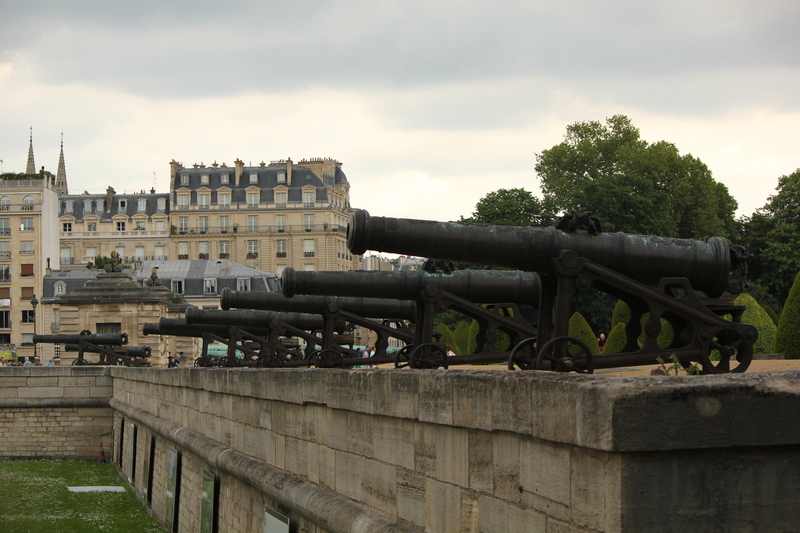 I thought I’d head first towards Les Invalides, just because I did not go there on my last visit to Paris. Also, it looked like rain, so I did not want to stray too far just yet. So, an easy stroll took me to this vast park and massive building that houses the Musée de Armee and the Tomb of Napolean. 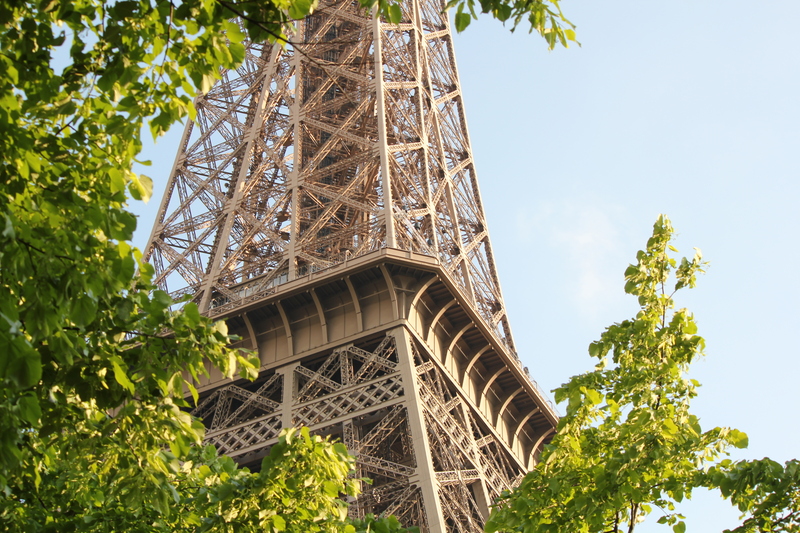 After a few raindrops, the sun came out and I headed in the opposite way past my hotel to the Champs de Mars and the symbol of Paris, the Eiffel Tower. 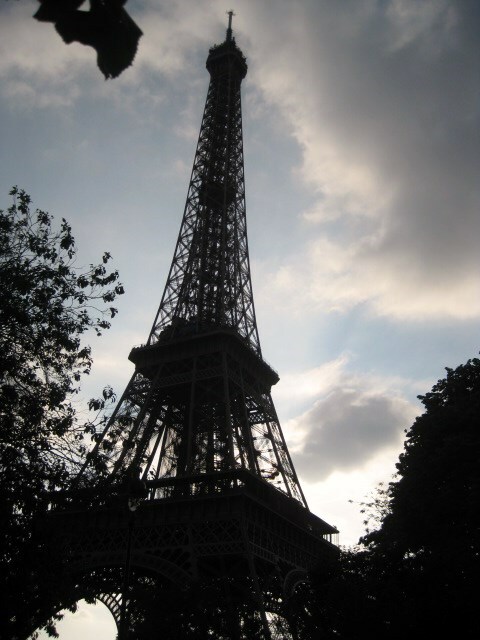 So far, I had a leisurely and calm walk – then I approached the tower and the crowds of people in lines that snaked in many directions. It was confusing to see where any of the lines actually ended and it felt like the entire world was represented in this space. I decided to forgo the crowds – I have pictures of being on the tower in 2001 with the lights sparkling. This trip was about doing different things and just soaking in the energy and the magic of Paris. I enjoyed the park, people watching and taking pictures. Heading back to Rue Cler, I spent the rest of my evening at one of the corner cafes, enjoying a nice dinner, wine and espresso. Day 17 Paris on the First Sunday of the Month and Museums are Free!